What is your position on the current VT income tax structure? Would you support a change in the Vermont income tax to support and promote business growth in Vermont? A: I can't really speak to how corporations are taxed in Vermont. My expertise covers only personal income taxes, which does include some small businesses that fall under self-employment, e.g. contractors, daycare providers, etc. Currently Vermont's personal income tax is not pegged to the federal tax rate. It only uses the federal taxable income as the starting point for determining the Vermont taxable income. After state-specific additions and subtractions are applied, the VT taxable income is taxed according to a graduated rate. I don't see any need to change this system. Since I don't know a lot about how the corporate tax structure differs, I am open to information and suggestions. However, there are tax-related things that can be done to help businesses grow and create jobs in Vermont. I would favor tax credits for increasing the number of employees from one year to the next. I would favor creation of low-interest loans funded through bonding for startup businesses. I would also favor a temporary reduction of the statewide property tax on new businesses to help reduce startup costs. Beyond tax policy, there are other steps we can take to improve conditions for economic growth. I believe that some type of public option universal health insurance program, possibly a single-payer system, would help reduce the costs of health insurance to both businesses and individuals. I'm looking forward to the proposals of the Health Care Commission created by S.88 this year. I believe that access to high-speed broadband throughout Vermont is essential if we want to grow 21st century businesses. I believe that we need to keep our education standards high so that we have a workforce with the skills businesses need. 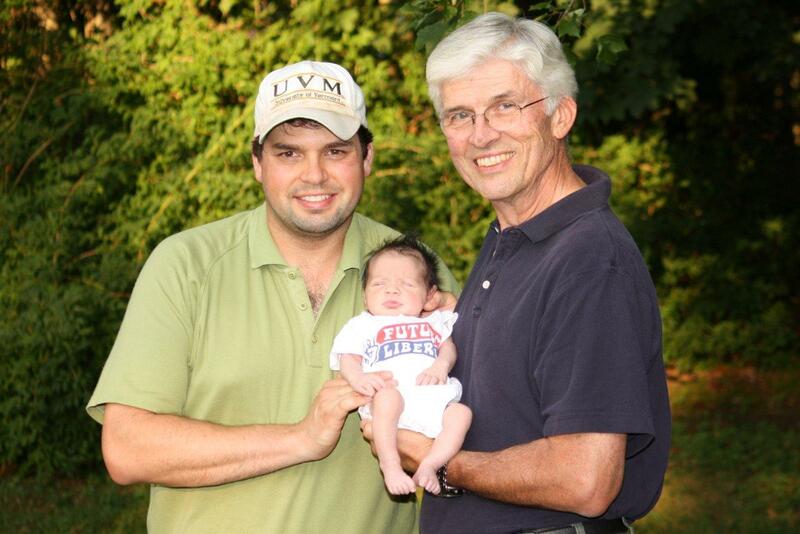 I am happy to announce the arrival of Janet's and my newest grandchild, Guthrie Yantachka, who arrived on July 16th. Dad Mark and Mom Beth are doing great and getting used to their new status as parents. Guthrie and his parents live in Westport, CT.
Guthrie joins his four cousins, Annalise, Isabella and Nathaniel of Norwalk, CT, and Reid of Cincinnati, OH, as Mike and Janet's 5th grandchild. There's a new farmstand in town. A virtual farmstand. It's online and you can get there from here: http://www.farmstandcoop.com/. "Farmstand co-op.com believes that everyone in Charlotte should have access to fresh local food, whether they garden or not. By increasing local food consumption, we can help build community resilience and sustainable capacity. "We are working with a range of local growers to ensure that there will always be fresh food for sale through Farmstandco-op.com and we particularly encourage very small family farmers or gardeners who have only small amounts of highly-seasonal produce to use this site. Summer 2010 is our pilot season." • Help build community resilience and capacity"
Check it out and see for yourself.